The Sheraton Philadelphia City Center Hotel is conveniently located only blocks from the world-renowned museums of Philadelphia, including The Philadelphia Museum of Art, The Franklin Institute and The Rodin Museum. All meetings will be held in the Sheraton Hotel. 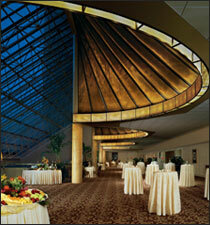 Room block at the Sheraton Philadelphia City Center Hotel and Conference Center has been SOLD OUT. A limited number of rooms are available at the same group rate at the Embassy Suites Philadelphia - Center City, located at 1776 Benjamin Franklin Parkway, a short walking distance from the Conference Center. Be sure to mention "Rhinology World". The Four Seasons Philadelphia is on Logan Square, across from the Sheraton and the Swann Memorial Fountain. A limited number of rooms have been reserved at the Four Seasons Hotel for Rhinology World 2009 guests at a special group rate of $275 (single/double) + tax per night. To reserve a room, please email:Groups.phi@fourseasons.com or call 215-963-1500, and let them know that you will be attending the Rhinology World meeting.